Is your orchid dying? Well maybe your orchid is not completely dying, but rather, it is just really sick with disease. There are three categories that orchid diseases fall into. These categories are: fungal, bacterial, and viral. By being able to determine what is wrong with your orchid, you can then figure out the best course of action that you should take in order to treat it. 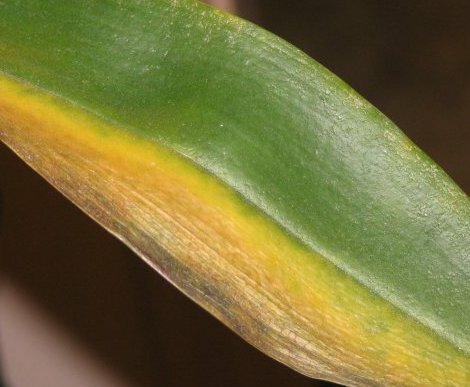 There are lots of different signs of orchid disease but some of the common ones are abnormalities on the foliage such as brown, black or yellow spots; abnormal specks or spots on the coloring on the flowers themselves, or holes in the leaves. One thing to remember, before you try to treat an orchid that has a disease, is to avoid cross-contamination. Disease can spread relatively quickly among plants so it is important to separate the dying orchid from your other house plants. You should always use fresh potting medium and sterilize pots that you want to use again. You don’t want to transfer any disease to a healthy plant just because of carelessness. There are several fungicides and bactericides available that can be used to treat orchid disease. One of these solutions is Physan 20, which acts as a disinfectant, fungicide, virucide, and algaecide. Because the solution can be used for several different purposes, you will need to mix the correct ratio of solution to water, as per the instructions on the label. Another popular choice is Phyton 27, which is a copper-based, broad-spectrum pesticide, bactericide, and fungicide that which, after applied, is absorbed into the plant’s tissues. There are also a few natural remedies you can use to treat a dying orchid. The first of these natural remedies is cinnamon, which has antifungal properties. The second of these natural remedies is Listerine mouth wash (original), which is a fungicide and helps to battle some orchid diseases. The best way to prevent introducing orchid disease into your home is by inspecting the plant thoroughly before you even bring it home. However, if you do find that your orchid is riddled with disease and is dying, as mentioned above, there are some treatments that will help you to save your orchid. By using these treatments to revive your dying orchid, you will have a huge sense of accomplishment.